Remember the polymer clay flowers I made a few weeks ago? this is the outcome, a rather charming choker style charm necklace. It reminded me of some of the beautiful gardens you see outside the little cottages in the country side. Its available in my Etsy shop right now. 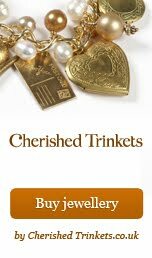 Cherished Trinkets is undergoing some quite drastic changes at the minute with lots of new ideas and a new web site in the pipe line. Mark, may partner is working on new designs as we speak. I am hoping to have a site that I will be able to update myself so that I don't have to rely on Mark so much. The result should mean that there will be more jewellery. Yay! In the meantime all my new jewellery is being uploaded to Etsy although there are still some designs on my site. We're off to the market now to buy ingredients for a stew I'm making. Can't wait! 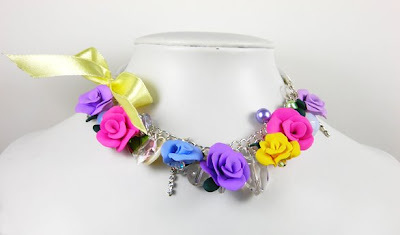 Great work Janine - I've been waiting to see what you turned those polymer roses into! Looking forward to seeing the new site. I'm sure it'll be fantastic. Hope the stew goes OK! Thanks for you lovely comment virginia! Mark's on his Mac now and I keep getting shouted to go and have a look at what he's done. Bless! Stew is in the oven it takes blumming hours but its worth it!!! What a striking necklace Janine! Such bold and beautiful colours - fab!